Last year, I travelled through the most beautiful country in the world, gathering references for my second wildlife map of a country after India. 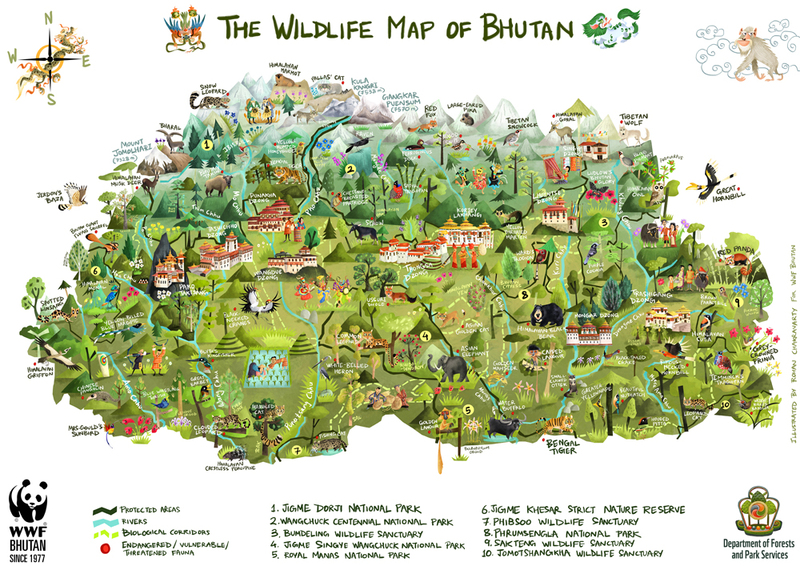 Here's The Wildlife Map of Bhutan, commissioned by WWF Bhutan! Bhutan's rich natural heritage stems from the fact that 72% of its land is under forest cover! This is no ordinary feat. 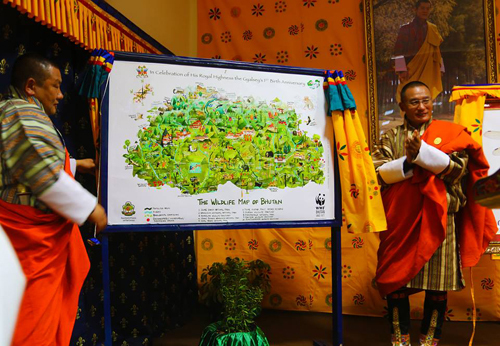 In addition to this, Bhutan is also a record holder for being the world's first carbon- negative country! The fauna of Bhutan- seen here are Bhutan's National butterfly- the Ludlow's Bhutan Glory, along with its mammals- the national animal, the Golden Takin, Golden Langur, Bhutan Giant Flying Squirrel, Himalayan Marmot, Pallas' Cat, Golden Cat, Himalayan Goral, Small-clawed Otter, Serow, Bharal, Red Panda, Marbled Cat, Bengal Tiger, Leopard, Eurasian Lynx, Dhole, Clouded Leopard, Himalayan Red Fox, Spotted Linsang, Himalayan Black Bear, Asian Elephant, Capped Langur, Large-eared Pika, Leopard Cat, Snow Leopard, Himalayan Musk Deer, Chinese Pangolin, Himalayan Crestless Porcupine, Asian Elephant and Tibetan Wolf. The birds of Bhutan- its national bird, the Raven; a bird revered in Bhutanese mythology and folklore- the Black-necked Crane, with Blood Pheasant, Blyth's Kingfisher, Cutia, Himalayan Owl, Grey-crowned Prinia, Ward's Trogon, Brown Parrotbill, Beautiful Nuthatch, Ferruginous Duck, Great Hornbill, Chestnut-breasted Partridge, Great Barbet, Jerdon's Baza, the critically endangered White-bellied Heron, Greater Yellownape, Himalayan Monal, Himalayan Griffon, Rufous-necked Hornbill, Mrs. Gould's Sunbird, Purple Cochoa, Satyr and Temminck's Tragopans, Yellow-billed Blue Magpie, Tibetan Snowcock, Yellow-rumped Honeyguide and Wedge-billed Babbler. The Flora of Bhutan- its national tree- the Bhutan Cypress, the national flower, Blue Poppy, with spruce, firs, junipers, birch, rhododendrons, yew, maple, cycas, Bulbophyllum and Sal. The people of Bhutan- Archery (Bhutan's national sport), Tsechu (the harvest festival and masked dance), textile weaving, harvesting of cordyceps, Bhutanese monks, red-rice farming, basket weaving, highland Shertukpen and Monpa families. Some iconic structures of Bhutan- Paro Taktsang (Tiger's Nest Monastery), with Tashichhu Dzong, Trongsa Dzong, Mongar Dzong, Wangdue Dzong, Trashigang Dzong, Singye Dzong, Lhuntse Dzong, Khurjey Lakhang, and the mountains Gangkar Puensum (Bhutan's tallest), Jhomolhari and Kulakangri. Some mythical creatures that feature on the map- Garuda (top left), the Snow Lion (top right), Druk (centre, on the map's compass), tiger and Yeti (bottom right).